Is it crazy that I'm already thinking "Thanksgiving"?? Fall just brings out the yummiest and coziest holidays- my favorite being Thanksgiving (as well as our wedding anniversary, hehe). So once the weather starts to cool and our trees...sort of....uhhh change...(in their own Southern California way, that is) I can't help but think of all the home made delicious foods I know we Mains will be devouring all season long. Thanksgiving, or not! If you're like me, you've already started Pinning fall/autumn inspired recipes since like, August. Maybe you've fulfilled your "need to bake" quota. If not, here are a few of mine that certainly top the list! 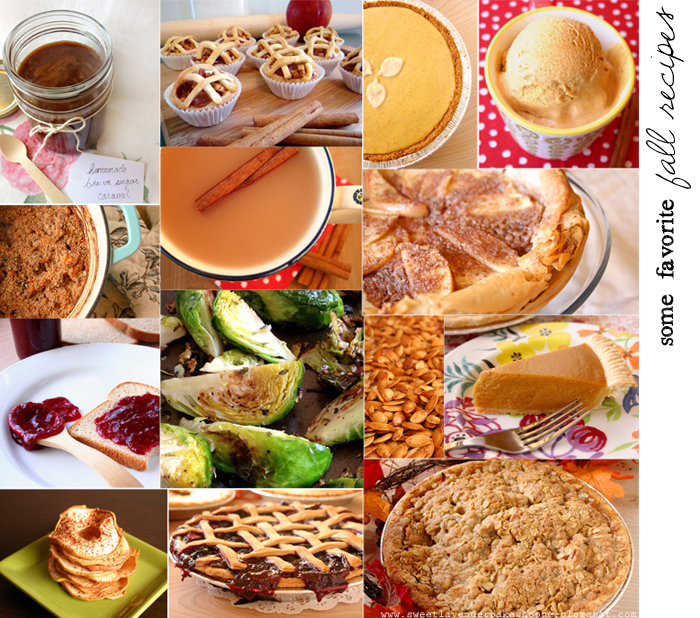 Apples, Pumpkins + Pies Oh My! Whenever I make this brown sugar caramel sauce I make extra. It's ridiculously good on ice cream, yogurt, or shoot...on your dipping finger. I'm totally a lover of miniature things. These mini apple pies are NO exception. Although I'm not the biggest cheesecake fan, this pumpkin cheesecake with a ginger browned butter crust makes a convert outta me! For those of us living in the part of the world in which nature is confused about what it means to be Autumn, and still sweating their lives away in the HOT heat, this pumpkin pie ice cream should cool you down. For those of you who have your sweaters on and fireplaces going already, this ham, sweet potato + black bean casserole is a super yummy (and healthy) dish to add to your dinner repertoire. 4 honest to goodness ingredients in this cinnamon tea. It's amazing, good for you, and makes your home smell heavenly! Don't make one apple almond phyllo tart..make two. Believe me. If you can find fresh cranberries, snag em! They're so good for you and really add to this cranberry strawberry jam. These simple roasted brussels sprouts made a brussels sprouts lover out of me. PS- I hated them once upon a time. Don't throw away your Jack-O-Lantern seeds! Save em, wash em, and make this sweet + spicy roasted pumpkin seed recipe stat! The mother of all Thanksgiving recipes. This, I promise. My brown sugar pumpkin pie will satisfy all your Autumnal needs. When you come home from apple picking, please please make some homemade, no sugar added organic apple chips to snack on. They are so good in lunches and for kiddies! Some don't dig pumpkin pie. That's totally weird ok! Try this mixed berry pie instead. PS- it includes a little bit of good red wine! The quintessential fall recipe- apple pie with crumb topping. Get your vanilla ice cream ready.